SineSet ELECTROMAGNETIC COMPOUND SINE PLATES by Suburban Tool, Inc.
Chuck top plates are laminated from 1/8" steel & 1/16" stainless steel, then furnace-brazed to form one solid piece. All units are sealed against dirt & liquids. Longitudinal (lengthwise) or transverse (crosswise) poles are available, based on the size & shape of the part to be held. Compound sine plate and electromagnetic chuck can be used together or independently. 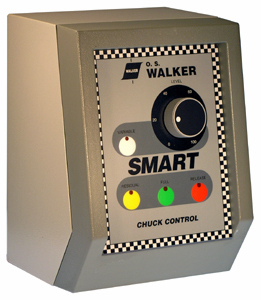 Electromagnetic chuck can be quickly removed or replaced using only four bolts. 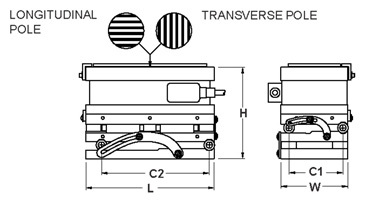 Two self-storing, hardened & ground rails included for the sine plate. Two side rails included for the electromagnetic chuck. 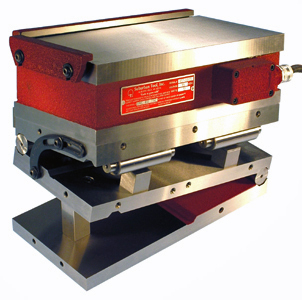 Gage block rolls provide dual 0.200" minute steps for setting small angles with standard gage blocks. Angular accuracy guaranteed within 5 seconds of arc up to 15°, within 10 seconds up to 30°, & within 15 seconds up to 45°.